Audio files were an early stirrer of excitement when the web came along in the Nineties. They did not need high speed internet access, so were happily accessible while videos were still stammering and stuttering. But - perhaps because they were not much of a technical challenge – they were never seen as particularly exciting. The spoken word was always useful, particularly to people who could not see well, but few people would want just sound when they could get pictures as well. Or so the thinking went. But those of us who hung on to speech radio as an important link with the outside rather appreciated a world delivered into our ears rather than our eyes. And I’m happy to say the rest of humanity has now caught up. Audiobooks are huge, podcasts are even bigger. The BBC, which has always been a big radio provider, is now pushing its podcasts hard, and so are other broadcasters. But what of corporations? They are in there too. I am always suspicious of bandwagons, but I feel this one will keep on rolling. Audio will never be as quick to absorb as text, but for people whose eyes and hands are occupied (for example while driving or in the gym), podcasts make a lot of sense. As they do for people who like radio and, of course, the visually impaired. Another advantage over video is that there is not a desperate need to keep them short – if people are driving they want a chunky listen, which is why 20 to 30 minutes is normal. Finally, the nature of podcasts means that you can subscribe to them – while some just play from sites, most are also delivered through an app: people can listen to them without ever going to the ‘mother site’. Here are five we listened to. They each take a slightly different approach, which is what tends to happen when new things are introduced (or re-introduced). Where should they be kept on a site? Should they play direct or through a player (and if so, which player)? I suspect a standard approach will relatively quickly be adopted; that tends to happen. 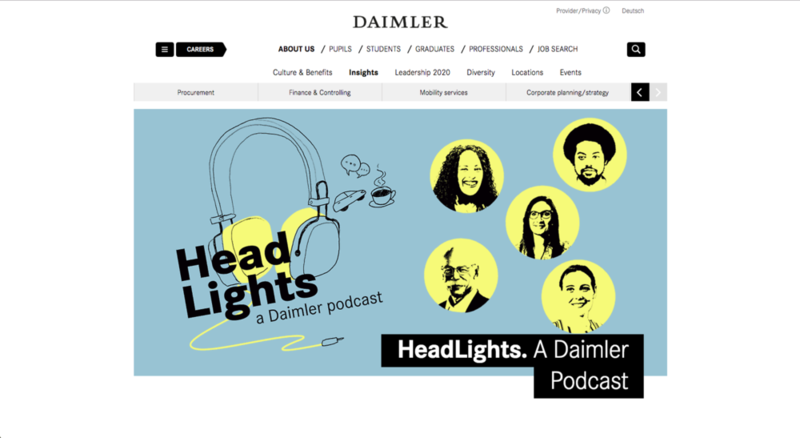 Daimler has just launched its Headlights podcast series. It is currently promoting it on the home page of Daimler.com, though it actually lives in Careers, which is a clue to the target audience. A new episode is launched every Monday, alternating between English and German, and is accompanied by links to subscribe on various players. Headlights has a young and upbeat feel, and kicked off with an interview with the CEO, followed by one with the head of an incubator unit. It should do well with young jobseeking audiences. Daimler has an interesting site because it is happy to try things out in the cause of innovation, and has been running ‘audio reading’ versions of its blog posts since 2015. Presumably these were included primarily as an accessibility aid, but they are now also available as podcasts. It is encouraging to see an accessibility tool becoming a standard bearer for new technology. Shell launched Inside Energy initially as an iPad app, but technological fashions move on and it is now a section of Shell.com with a shiny new Energy Podcast. This is less ambitious than the others in that it is touted as a five part series – but presumably if it is successful there will be more. It does not play directly from the site – you have to choose whether to hear it through iTunes, Google or Spotify. The first episode, ‘Battery technology: where could it take us’, is a professionally presented and interesting piece. It sounded like a serious radio programme and set me wondering whether it is tainted by being a corporate production. I decided not – the interviews are all with scientists and engineers, and it would be nice to think that Shell’s specialists know as much about energy as anyone else. Morgan Stanley uses its Ideas podcasts to present itself as the thinking person’s investment bank. The current programme is part of season four, we are told, and is based on a ‘trip to the future’. The destination here is Dar es Salaam which, we learn, has one of the most advanced rapid transit systems in the world. Choices here are to listen direct, or on Apple Podcasts or Google Play. This is a serious documentary about a general interest subject, and it might make you wonder why an investment bank is bothering to produce it. But maybe that it the strength – it is hard to see how talking about a Tanzanian transport system directly benefits Morgan Stanley. In any event, if someone is sufficiently intrigued to subscribe to the podcast series, they will find they are being fed material by the bank without even trying. Brand-building at its most subtle. Goldman Sachs has just launched the 120th of its Exchanges podcasts. Even though the interviews are interesting (about market and other developments) it is not as professional as the others. The presenter is the head of corporate comms and he sounds rather rushed and perhaps a teeny bit bored. So these podcasts, which can be played direct or though iPlayer, could give us another lesson. That if you are going to become a broadcaster, you need to do it professionally – and that may well involve using professional broadcasters.